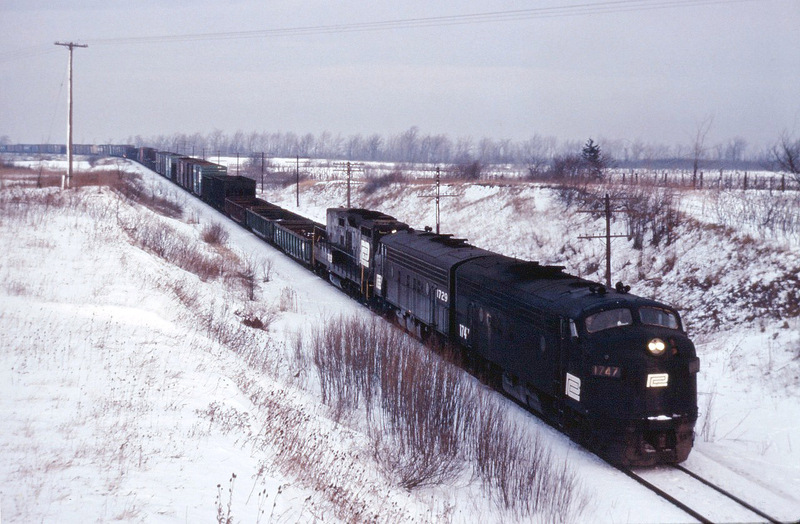 Railpictures.ca - Doug Page, Bruce Acheson collection Photo: Toronto-Buffalo (Frontier Yard) train TF-2 struggles up the grade into Vinemount behind Penn Central F7As 1747, 1729 and GP9B 3829. Normally an overnight train, this morning it is quite late–likely due to a combination of winter weather and less-than-reliable power. | Railpictures.ca – Canadian Railway Photography – photographie ferroviaire Canadienne. Caption: Toronto-Buffalo (Frontier Yard) train TF-2 struggles up the grade into Vinemount behind Penn Central F7As 1747, 1729 and GP9B 3829. Normally an overnight train, this morning it is quite late--likely due to a combination of winter weather and less-than-reliable power.